A monthly email for content opportunities on Twitch. Since when was GTA Role-Playing the new shiny thing? Mark here from The Emergence. I received really good feedback from everyone after last month’s first Appear and Emerge email. So, to continue the consistency I’ve spent some time deep diving into the opportunities on Twitch this month! What is Appear & Emerge? 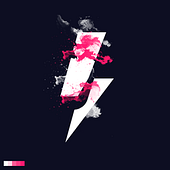 A Twitch Tier list for people looking to get into streaming, or existing streamers looking to spot new opportunities across Twitch and the streaming world. Anyone within the gaming or streaming industry may find it interesting too! PS if you are looking for more in-depth thoughts on the social media, content, streaming, the weather and the gaming industry… subscribe for my ultra secret newsletter (coming soon)! There are always games with attention on them from both viewers and broadcasters, or games that have a die-hard fan-base but not enough streamers are playing them. But sometimes we don’t see these opportunities because we are so busy focusing on creating our own content and engaging with our communities. 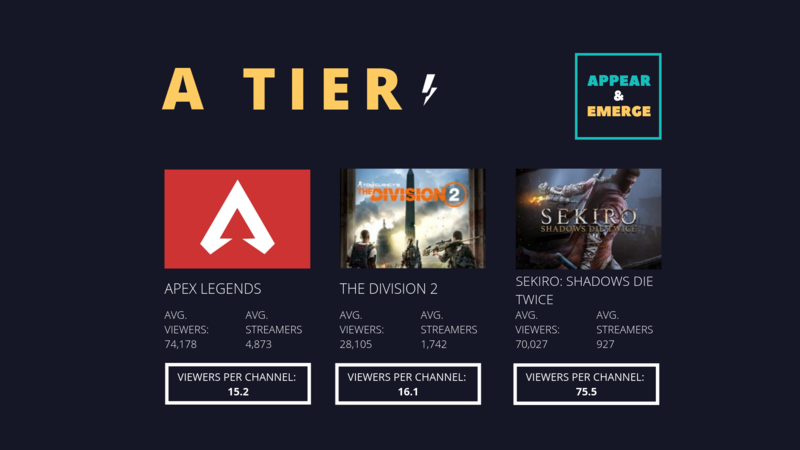 This isn’t conclusive evidence that you’ll be popular if you stream these games, but it gives a wider trend to what could work for you & your community. In the S Tier, it’s the flavor of the month. Role-Playing Grand Theft Auto V. With Summit1G looking for games to play after his successful role-playing Sea of Thieves streams, he found a fantastic busy role-playing GTA server. Other creators such as Lirik, TimTheTatman and Kitboga followed and all hell has broken loose, with what feels like everyone trying to get involved. 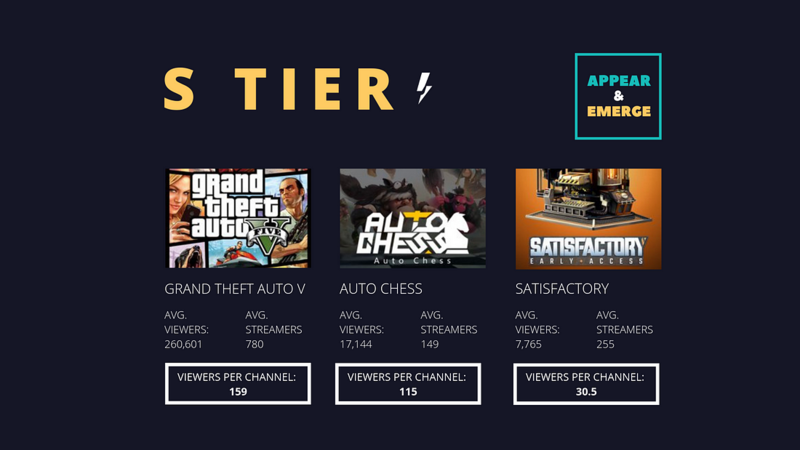 Existing creators such as Vader and Bhudda have seeing seen some of the biggest jumps in viewership I've ever seen on Twitch. Satisfactory comes from the developer team behind Goat Simulator Deep Rock Galactic (another game on the rise). Playable in both solo mode but particularly fun in multiplayer, it’s a first-person building game that a lot of variety streamers are suddenly exploring. As it is brand new there is a lot of attention on it, and it’s worth checking out! While we saw The Anthem fall flat on Twitch, Tom Clancy’s The Division 2 has seen a great response from gamers and Twitch viewers and has flown up the charts since it’s release. While not the best story, it’s map and gameplay are enjoyable for both streamers alike viewers alike. While its peak viewers have probably been and gone, this doesn’t stop it from keeping viewers engaged for a while especially if Ubisoft keep updates coming. Sekiro: Shadows Die Twice is the new single-player story-mode game that has grabbed Twitch’s eyes and ears. How long this lasts will be something to keep an eye on, but we have seen games like Dark Souls pick up a variety and speed-running community post-launch hype. In the B Tier are three games that have seen a consistent community develop around them, but a surprising lack of new streamers or new content across Twitch. 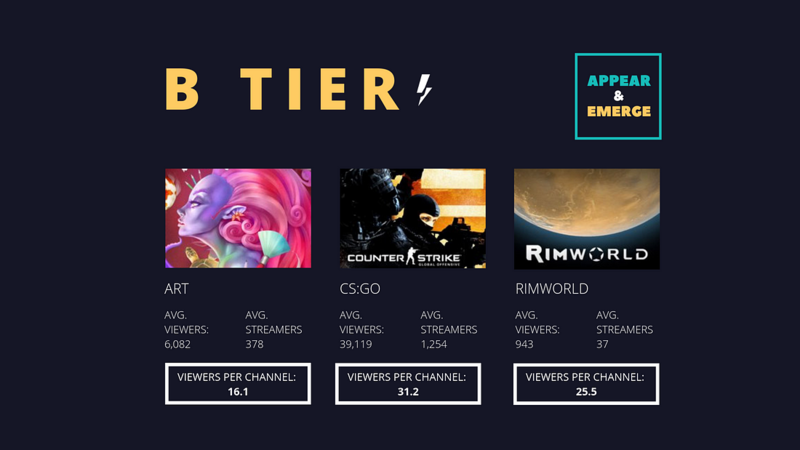 Art is very slowly growing as more creators start running one-day a week streams that involve them painting, drawing or design a piece of art, and more new streamers join the category from external platforms to create content live. After a few hugely popular CS:GO esport tournaments, we’ve seen the ultimate FPS game pick back up and gain a viewership looking for more high-quality, high-tiered competitive gameplay. While more tournaments coming around, why not use the downtime to keep fans engaged while playing and talking about CS:GO? Talk about the different teams strategies, run through game-footage or discuss the tactics, gameplay and best moments. RimWorld has been going for years on early access and recently (finally) dropped into complete mode. Since then it has seen a big influx of both viewers and creators checking the game out, and building a community around the off-planet base-building story-telling game. Thank you for reading. If you have any feedback, you spot a typo or just disagree, then feel free to let me know via email, Twitter, smoke signal or carrier pigeon. We seek out the emerging heroes of the future.